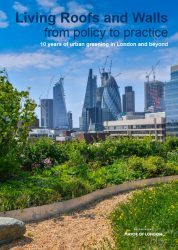 A report by Livingroofs.org revealing the remarkable growth in green roof space installed in London over the past 10 years is due to be published on 10 April. Shirley Rodrigues, London’s Deputy Mayor for the Environment, will launch the report at the forthcoming EUGIC conference which takes place at Here East in the Queen Elizabeth Park. The report, which was conducted in association with the European Federation of Green Roofs and Walls (EFB), measures the success of the Living Roofs and Walls Policy that was included in the London Plan in 2008. It also shows the tremendous progress in the provision of green roofs and walls in London over the last 10 years and how the policy has encouraged uptake in the absence of any financial incentives or mandatory requirement. The report features the first complete map of green roofs in the whole of London. This map will form the centrepiece of a detailed infographic on the types/areas/density of green roofs per inhabitant. Such level of detail regarding London’s green roofs has never before been published. Additionally, there will also be detailed infographic of the Central Activity Zone (CAZ). The original London green roof map published online by the Mayor of London features only green roofs in the CAZ. Originally published in 2015, the new infographic will chart the uptake of green roofs in the CZ up to 2017. Infographics will also be available for all 32 London boroughs plus the City of London on this site. All the infographics, online and featured in the report, are based on mapping undertaken by the Green Infrastructure Consultancy Ltd in partnership with the GIS team from the Ecology Consultancy Ltd. Finally, the report contains a league table of green roof cities around the world. This ranks cities, not in terms of area, but of density of green roofs per inhabitant. This is based on research, as yet unpublished by Humbolt University, and research undertaken during the writing of the report. The league table sets London’s performance in a global context. allowing an assessment of the city’s achievements in the light of the progress that other cities around the world have made over the past 10 years. Sign up to our newsletter to get up-to-date information published by Livingroofs.org. These companies are leading the way in delivering green roofs and walls in London. Some are doing so, not only in the UK, but across Europe. Their work features in the case studies section of the report and in future cases studies to be published on livingroofs.org. While the benefits of green roofs and walls are increasingly being recognised, their delivery is dependent on an experienced and mature industry, along with developers who recognise the benefits to their portfolios. There are still opportunities to sponsor Livingroofs.org. Do do not hesitate to contact us regarding a green roof project in London, the UK, Europe and beyond. The new green roof report’s authors, Dusty Gedge and Gary Grant, are internationally recognised authorities on urban green infrastructure. They were also authors of the original London technical report. Livingroofs.org and the EFB would like to thank the Mayor of London for supporting the production of this report.